Next up is this umbrella dance group. I loved the colors they were wearing and they had an excellent performance with the umbrellas. I only wish I had time to shoot a video of this too. It’s something I haven’t seen in the past parades that I have attended. I just love the huge variety this parade provides. 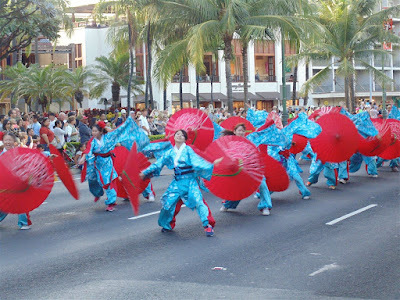 This entry was posted on Thursday, March 17th, 2016 at 12:39 am	and is filed under CityPhoto, Feature, Art, cultural, Hawaii Photo of the Day, Attractions. You can follow any responses to this entry through the RSS 2.0 feed. You can leave a response, or trackback from your own site.